Naypyidaw, officially spelled Nay Pyi Taw (Burmese: နေပြည်တော်; MLCTS: Nepranytau; pronounced [nèpjìdɔ̀], formerly known as Kyetpyay, Pyinmana or Kyatpyay, Pyinmana), is the capital city of Myanmar. The city is located at the center of the Naypyidaw Union Territory. It is unusual among Myanmar's cities, being an entirely planned city outside of any state or region, similar to Canberra in Australia, Brasília in Brazil, Washington, D.C. in the United States and Islamabad in Pakistan. As the seat of the government of Myanmar, Naypyidaw is the site of the Union Parliament, the Supreme Court, the Presidential Palace, the official residences of the Cabinet of Myanmar and the headquarters of government ministries and military. Naypyidaw is notable for its unusual combination of large size and very low population density. The city hosted the 24th and 25th ASEAN Summit, the 3rd BIMSTEC Summit, the Ninth East Asia Summit, and the 2013 Southeast Asian Games. Naypyidaw is Burmese for "abode of the king", and is generally translated as "royal capital", "seat of the king", or "abode of kings". Traditionally, it was used as a suffix to the names of royal capitals, such as Mandalay, which was called Yadanabon Naypyidaw (ရတနာပုံနေပြည်တော်). Naypyidaw has a short history. It was founded on a greenfield site near Pyinmana, about 320 kilometres (200 mi) north of the old capital, Yangon. Construction started in 2002. At least 25 construction companies were hired by the military government to build the city, including Asia World and Htoo Ltd.
On 6 November 2005, the administrative capital of the country was quietly relocated from Yangon to Naypyidaw, with minimal explanation from the government. The new capital's official name was made public on 27 March 2006, Myanmar's Armed Forces Day. Construction of this planned city began in 2002 and was completed by 2012. On 27 March 2006, more than 12,000 troops marched in the new capital in its first public event: a massive military parade to mark Armed Forces Day—which is the anniversary of then Burma's 1945 revolution against the Japanese occupation of Burma. Filming was restricted to the concrete parade ground which contains three enormous sculptures—depictions of King Anawrahta, Bayinnaung and Alaungpaya, who are considered the three greatest monarchs in the history of Myanmar. The city was officially named Naypyidaw during these ceremonies. It is not known why the capital was moved, but according to The Guardian, Than Shwe did it as a "vanity project". Naypyidaw is more centrally located than the old capital, Yangon. It is also a transportation hub located adjacent to the Shan, Kayah, and Kayin states. It was felt by governmental and military leaders that a stronger military and governmental presence nearby might provide stability to those chronically turbulent regions. Climate consideration could have also contributed to the capital transfer, since Yangon proved vulnerable to Cyclone Nargis, which killed over 100,000 people in Myanmar in May 2008. The official explanation for moving the capital was that Yangon had become too congested and crowded with little room for future expansion of government offices. During World War II, Pyinmana township, a part of the current city was the headquarters of Gen Aung San, the Father of the Nation of modern-day Myanmar. Naypyidaw is located between the Bago Yoma and Shan Yoma mountain ranges. The city covers an area of 7,054.37 km2 (2,723.71 sq mi) and has a population of 924,608, according to official figures. Chaungmagyi Dam is located a few kilometers to the north of Naypyidaw, while Ngalaik Dam is a few kilometers to the south. The Yezin Dam is farther away in the north-east. Naypyidaw is organized into a number of zones. The residential areas are carefully organized, and apartments are allotted according to rank and marital status. The city currently has 1,200 four-story apartment blocks. The roofs of apartment buildings are color-coded by the jobs of their residents; Ministry of Health employees live in buildings with blue roofs and Ministry of Agriculture employees live in those with green roofs. High-ranking government officials live in mansions, of which there are about 50. The city's Ministry zone contains the headquarters of Myanmar's government ministries. All the ministry buildings are identical in appearance. A parliamentary complex consisting of 31 buildings and a 100-room presidential palace are also located there. The zone also contains the city hall building, which has many characteristics of Stalinist architecture, but with a Burmese-style roof. High-ranking military officers and other key officials live 11 km (6.8 mi) away from regular government employees in a complex said to consist of tunnels and bunkers; this area is restricted to the public. The city also hosts a military base, which is inaccessible to citizens or other personnel without written permission. The government has set aside 2 hectares (4.9 acres) of land each for foreign embassies and headquarters of United Nations missions. The Chinese embassy has formally opened its interim liaison office in 2017. The liaison office is the first foreign office to be permitted to open in Naypyidaw. Bangladesh and Malaysia have also signed agreements to open embassies in Naypyidaw. The government confirms that proposals have been put forward by 11 other countries to move their embassies to Naypyidaw, namely Russia, China, the United States, India, Saudi Arabia, Qatar, the Philippines, Indonesia, Thailand, Turkey and Kuwait. In February 2018, State Counsellor Daw Aung San Suu Kyi chaired a meeting at the Ministry of Foreign Affairs in Naypyidaw where she urged foreign governments to move their embassies to the capital. The Hotel zone has a handful of villa-style hotels on the hilly outskirts of the city. There are currently twelve hotels located in or near Naypyidaw. Eight of these are located within the Naypyidaw Hotel Zone, and two are located in Laeway (Lewe) on the Yangon-Mandalay Road. Forty villas were constructed near the Myanmar Convention Centre in preparation for the 25th ASEAN summit conducted in Naypyidaw in November 2014. Construction of the villas was begun in 2010 by the government. However, funds were limited, so the project was later put out to tender for completion by private sector investors. A total of 348 hotels and 442 inns were constructed to house the athletes and spectators of the 2013 Southeast Asian Games, which was hosted in Naypyidaw. Naypyidaw Myoma Market is currently the commercial centre of Naypyidaw. Other shopping areas include Thapye Chaung Market and Junction Centre Naypyidaw. Junction Centre is the city's first privately operated shopping centre. There are also local markets and a restaurant area. Ngalaik Lake Gardens is a small water park situated along the Ngalaik Dam, near Kyweshin Village on Ngalaik Lake (about 11 kilometres (7 mi) from Naypyidaw). Opened in 2008, facilities at the Ngalaik Lake Gardens include water slides, natural resorts, lodging and a beach. The gardens are open to the public during Thingyan holidays. Also opened in 2008, the 81-hectare (200-acre) National Herbal Park has exhibits of plants having medicinal applications from all of the major regions of Myanmar. There are thousands of plants at the park, representing hundreds of different species. Behind the city hall, there is a park with a playground and water fountain complex, which hosts a musical light show every night. The Naypyidaw Zoological Gardens opened in 2008 with 420 species and now with 1500 animals. The main attraction of the zoo is the climate-controlled penguin house. The animals were shipped to it from the old one in Yangon. The Naypyidaw Safari Park officially opened on 12 February 2011. Naypyidaw also has two golf courses (Naypyidaw City Golf Course and Yaypyar Golf Course) and a gem museum. Similar in size and shape to the Shwedagon Pagoda in Yangon, Uppatasanti Pagoda was completed in 2009. This new pagoda is named the Uppatasanti or "Peace Pagoda". The stake-driving ceremony for the pagoda was held on 12 November 2006. The invitation card for the ceremony opened with a phrase "Rajahtani Naypyidaw (the royal capital where the king resides)". The pagoda is just 30 cm (12 in) shorter than the Shwedagon Pagoda. Uppatasanti translates roughly to "Protection against Calamity". It is the name of a sūtra prepared by a monk in the early 16th century. It is to be recited in time of crisis, especially in the face of foreign invasion. Naypyidaw is administered by the Naypyidaw Union Territory wich is under the direct administration of the President. 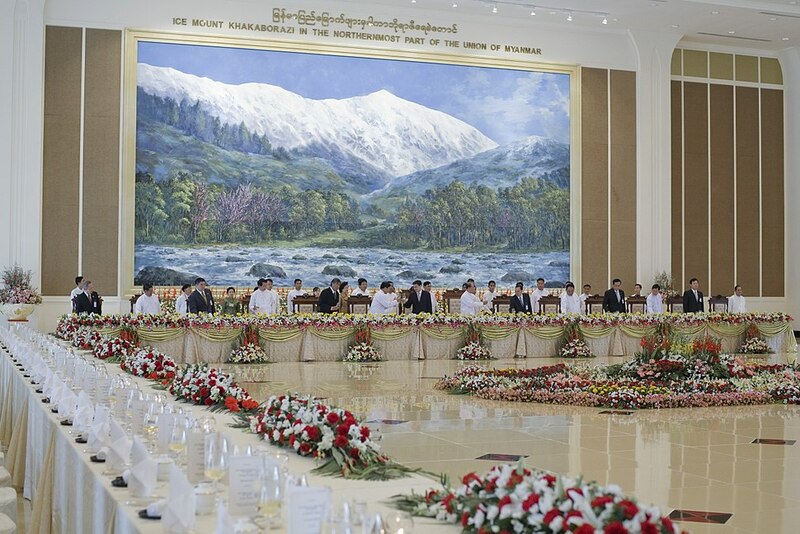 Day-to-day functions are carried out on the President's behalf by the Naypyidaw Council led by a Chairperson. The Chairperson and members of the Naypyidaw Council are appointed by the President and include both civilians and Armed Forces representatives. Naypyidaw Development Committee (NPTDC) is the administrative body of the capital. Naypyidaw Development Committee (NPTDC) consists of 5 to 9 members, it is led by a Chairman who acts as the Mayor, and a Vice-Chairman who acts as the Vice-Mayor. The Naypyidaw Union Territory consists of the city proper (downtown) and eight surrounding townships. Downtown is further divided into four wards. Pyinmana, Lewe, and Tatkone townships were all formerly part of Yamethin District. Ottarathiri, Dekkhinathiri, Popphathiri, Zabuthiri, and Zeyathiri are all new townships currently under construction. As of December 2009, most government ministry offices have been relocated to the administrative capital. Only the offices of ministries' directorates remain in Yangon. There is sometimes some controversy about land use and changes in land ownership related to the urban spread of Naypyidaw. In late 2014, for example, there were suggestions in parliament that land grabs were occurring near the Dekkhinathiri Township and that existing laws needed to be amended to provide better protection for farmers. There has also been criticism from some members of parliament about the size of the Naypyidaw Union Territory and the fact that money is being spent on urban infrastructure (such as lighting around lakes) although the facilities do not attract much use. Naypyidaw International Airport, also known as Ayelar Airport, is 16 km (10 mi) south-east of the city, between the towns of Ela and Lewe. It is served by all domestic airlines—Air Bagan, Air Mandalay, Myanmar National Airlines, FMI Air and Yangon Airways—with regular flights to Yangon and other cities across the country. According to the Transport Ministry, the airport has a 3.6 kilometre runway, a control tower 69 meters high and 10 passenger boarding bridges and can take 50,000 to 65,000 flights annually. Bangkok Airways and China Eastern Airlines serves the airport with international flights to and from Bangkok and Kunming. Public transport services are limited between neighborhoods. The four-lane, 323.2 km (200.8 mi) Yangon-Naypyidaw highway links Naypyidaw with Yangon directly and is part of the 563 km (350 mi)-long overall Yangon-Naypyidaw-Mandalay Expressway. There is a 20-lane boulevard; like most roads in the city, it is largely empty. Naypyidaw has four-lane roads and multilevel, flower-covered roundabouts (traffic circles). Government ministries run shuttle buses in the morning and evening to their respective buildings. The city has a central bus station and one taxi company, which is operated by the military.Motorbikes are banned from some roads in Naypyidaw city limits, including sections of Taw Win Yadana Road, as a result of hundreds of traffic accident-related deaths in 2009. Naypyidaw railway station was opened at milepost No. (233/0), between Ywataw station and Kyihtaunggan station on the Yangon-Mandalay railroad with a station area of 2,700 m × 1,200 m (9,000 ft × 4,000 ft) and a covered area of 334.5 hectares (826.5 acres). Construction began on 8 December 2006 and Naypyidaw railway station was opened on 5 July 2009, even though the overpass, locomotive shed, concrete road leading up to the station, parking lot, passenger lounge and platform were not completed. Before the opening of Naypyidaw railway station, Naypyidaw was served by Pyinmana and Lewe stations, though only Pyinmana station is on the main rail line (which extends from Yangon-Bago-Naypyidaw-Thazi-Mandalay). Lewe station is on the way from Pyinmana to Kyaukpadaung. It takes nine hours by train to get from Yangon to Pyinmana; trains leave at 12:00 and arrive at 21:30 local time. In August 2011, Russian news media announced that a Russian-based firm would be constructing a 50-kilometre (31 mi) metro line, which would be the country's first underground rail system, underneath Naypyidaw. However, the Rail Transportation Ministry then announced that the plan had been cancelled due to lack of demand and budgetary limits. The city is served by five public hospitals: 1000-bed Naypyidaw General Hospital , Naypyidaw Women Hospital, Naypyidaw ENT Hospital, 100-bedded Naypyidaw Traditional Medicine Hospital and Naypyidaw Orthopaedic Hospital. There is also a 300-bed Obstetric, Gynaecological and Children's Hospital of Defence Services, which is one of the teaching hospitals of Myanmar Defence Services Medical Academy. The nearby towns of Lewe, Pyinmana, and Tatkone each have one hospital. Naypyidaw F.C, a Myanmar National League football club, is based at Wunna Theikdi Stadium in Naypyidaw. The Myanmar Motion Picture Academy Awards are held annually in Naypyidaw given to the highest achievers in Burmese cinema. There is a movie theater in the Junction Centre Mall in Naypyidaw. There are two others in nearby Pyinmana, and one in Tatkone Township. The headquarter of the Ministry of Information is located in Naypyidaw. Since 2009, Naypyidaw has had mobile phone coverage. The Myanmar Alin and the Kyaymon in Burmese and the New Light of Myanmar in English are available in Naypyidaw. Since 18 November 2011, the Ministry of Information has begun publishing a weekly journal called the Naypyidaw Times, to report on government policies. There are a number of AM and FM stations broadcasting in Naypyidaw. The main available channels in Naypyidaw are Radio Myanmar (operated by MRTV), Cherry FM, Mandalay FM, FM Bagan, Padamyar FM, Pyinsawaddy FM, Shwe FM and City FM. MRTV, MRTV-4 and MWD are the main channels, broadcasting Burmese-language programmes in Naypyidaw. Privately owned enterprise Sky Net provides more than 70 pay-TV channels of local and international origin. MRTV broadcasts 19 free-to-air channels and MWD broadcasts 8 free-to-air channels. Other TV channels such as Channel 7, 5-plus and Myanmar International, the English-language channel that targets overseas audiences are also available. The establishment of Naypyidaw was an extraordinary project. However, the shorter-term and long-term consequences of establishing the new capital are not yet clear. Data on the economic impact of constructing Naypyidaw are scarce but the national economic impact of the huge construction effort must have been very considerable. One estimate puts the cost in the range of $3–4 billion although only part of this estimate is for cash spending because non-cash investments were also reportedly involved in supporting the construction effort. There must have been a large localized construction boom, the result of which is that a vast new economic asset has been created. On the other hand, current (mid 2014) utilization of the vast new asset is very low. Most of the remarkable main roads in the city (10 lane roadways are common) are ghost roads for much of the time. There are also large areas of vacant land between many buildings. One of the consequences of administration for the nation is that there is now continual travel by vehicles along the relatively new 300 km highway from Yangon to Naypyidaw. But the highway is four lanes for most of the way. There is clearly a large amount of excess capacity because there are relatively few vehicles for much of the time on the road. Most trucks traveling North from Yangon to Naypyidaw and Mandalay are prohibited from using the highway. The Asian Development Bank has estimated that allowing more trucks onto the road would save over $100 million per year in reduced traveling time and other savings. Remarkably, there are plans to turn the road into a six lane highway because it is believed that a wider road would be safer to travel on. In March 2014, Naypyidaw was one of the locations featured on the British motoring TV show Top Gear during a two-part special event in Myanmar. ^ a b တိုင်းခုနစ်တိုင်းကို တိုင်းဒေသကြီးများအဖြစ် လည်းကောင်း၊ ကိုယ်ပိုင်အုပ်ချုပ်ခွင့်ရ တိုင်းနှင့် ကိုယ်ပိုင်အုပ်ချုပ်ခွင့်ရ ဒေသများ ရုံးစိုက်ရာ မြို့များကို လည်းကောင်း ပြည်ထောင်စုနယ်မြေတွင် ခရိုင်နှင့်မြို့နယ်များကို လည်းကောင်း သတ်မှတ်ကြေညာ. Weekly Eleven News (in Burmese). 20 August 2010. Retrieved 23 August 2010. ^ Department of Population, Myanmar. ^ "News Briefs". The Myanmar Times. Myanmar Consolidated Media. 20 March 2006. Archived from the original on 27 June 2006. Retrieved 1 April 2006. ^ a b c d e Pedrosa, Veronica (20 November 2006). "Burma's 'seat of the kings'". Al Jazeera. Archived from the original on 23 November 2006. Retrieved 21 November 2006. ^ "This 'empty' city is more than four times the size of London". indy100. 21 June 2017. Retrieved 21 June 2017. ^ "Buki Yuushuu". YouTube. Archived from the original on 24 July 2018. Retrieved 28 June 2017. ^ "Naypyidaw: Burma". Geographical Names. Retrieved 6 December 2011. ^ a b Marshall Cavendish Corporation (2007). World and Its Peoples: Eastern and Southern Asia. Marshall Cavendish. p. 650. ^ "Burma's new capital stages parade". BBC News. 27 March 2006. Retrieved 6 April 2006. ^ Kennard, Matt; Provost, Claire (19 March 2015). "Burma's bizarre capital: a super-sized slice of post-apocalypse suburbia". The Guardian. Retrieved 20 March 2015. ^ McGeown, Kate (8 November 2005). Burma's confusing capital move. BBC News. ^ Junk, Julian (2016). "Testing Boundaries: Cyclone Nargis in Myanmar and the Scope of R2P". Global Society. 30: 78–93. doi:10.1080/13600826.2015.1092423. ^ a b c d "Construction of Myanmar new capital continues". People's Daily. Xinhua News. 24 December 2009. ^ a b c d e f g Living in a ghost town. Bangkok Post. 18 October 2009. ^ Peck, Grant (5 October 2007). "Myanmar's Remote Capital Is Still a Work in Progress". The New York Times. Retrieved 20 May 2010. ^ "As poll looms, Myanmar still building parliament". Reuters. 17 January 2010. ^ "China embassy opens interim liaison office in Naypyidaw". The Myanmar Times. Retrieved 2018-05-27. ^ Mon, Su Myat. "Govt urges Naypyidaw move for embassies, but obstacles remain". Frontier Myanmar. Retrieved 2018-05-27. ^ "New hotels rise in Naypyidaw ahead of SEA Games". Weekly Eleven. 10 October 2012. Archived from the original on 13 November 2012. Retrieved 22 October 2012. ^ "National herbal Park". tours in Myanmar. toursinmyanmar. 2010. Retrieved 13 May 2017. ^ "Built to Order: Myanmar's New Capital Isolates and Insulates Junta". The New York Times. 24 June 2008. ^ "Myanmar unveils zoo in remote new capital | MACAU DAILY TIMES". Macau Daily Times. March 27, 2008. ^ "Safari Park (Naypyidaw) to open on 12 February". Bi-Weekly Eleven. 26 January 2011. Archived from the original on 30 April 2011. ^ Steinberg, David (2009). Burma/Myanmar: What Everyone Needs to Know. Oxford University Press. p. 133. ISBN 978-0-19-539068-1. ^ Weekly Eleven News Journal, Vol. 1, No. 44 (16 August 2006), p. 9. ^ 'Call for amending Naypyitaw Development Law', The Nation, 12 December 2014. ^ 'Naypyidaw Union Territory Should Be Shrunk, Says MP', Eleven, 11 February 2015. ^ "News Briefs (New air destinations)". The Myanmar Times. Myanmar Consolidated Media. 12 June 2006. Retrieved 29 June 2006. ^ Editorial, Reuters. "Myanmar opens international airport in new capital". U.S. Retrieved 2018-05-27. ^ Tun, Aung Hla (16 January 2010). "As poll looms, Myanmar still building parliament". Reuters. ^ Varadarajan, Siddharth (21 January 2007). In phantom capital, a city slowly takes shape. The Hindu. ^ Win Ko Ko Latt (21 March 2011). "Motorbike ban to be expanded in NPT". Myanmar Times. Archived from the original on 16 July 2011. Retrieved 18 August 2011. ^ "New railway station reflects dignity of Naypyidaw" (PDF). The New Light of Myanmar. Ministry of Information. 24 November 2009. Archived from the original (PDF) on 27 April 2011. Retrieved 22 July 2010. ^ "Import, export licensing moving to Naypyidaw". The Myanmar Times. Myanmar Consolidated Media. 29 May 2006. Retrieved 29 June 2006. ^ Nikishenkov, Oleg (5 August 2011). "Moscow exports the metro – to Myanmar". Moscow Times. Russia & India Report. Retrieved 8 August 2011. ^ Wade, Francis (2 August 2011). "Russia to build metro in Naypyidaw: reports". Democratic Voice of Burma. Retrieved 8 August 2011. ^ Sann Oo (5 September 2011). "Subway plan for Naypyidaw too expensive, says minister". Myanmar Times. Archived from the original on 4 February 2012. Retrieved 3 March 2012. ^ "China-Myanmar Established Biodiversity Research Institute Unveiled in Naypyidaw---Chinese Academy of Sciences". english.cas.cn. Retrieved 2017-10-19. ^ "EYE.ENT Hospital Naypyitaw". EyeMyanmar. 2016-03-09. Retrieved 2017-10-12. ^ "Naypyidaw Hospital looks to boost hygiene, reception services". The Myanmar Times. Retrieved 2017-10-12. ^ "Orthopaedic Specialist Hospital opens in Naypyidaw - Global New Light Of Myanmar". Global New Light Of Myanmar. 2015-07-21. Retrieved 2017-10-12. ^ Inc, IBP (2015). Myanmar Medical and Pharmaceutical Industry Handbook - Strategic Information and Regulations. Lulu.com. ISBN 9781312884472. ^ Editor. "The Museum of Sport in Naypyidaw is exhibiting more than 300 medals won by the nation's athletes". Archived from the original on 14 October 2017. Retrieved 13 October 2017. ^ "Venues & Rates". travelnaypyitaw.org. Retrieved 2017-10-19. ^ "Naypyidaw's Oscar Event". The Irrawaddy. IPG. 12 February 2008. Archived from the original on 19 August 2014. ^ "Information Ministry launches 'Naypyitaw Times Journal'". 2012-03-07. Retrieved 2018-05-28. ^ 'Surrounded by Poverty, a Lifeless Capital Stands Aloof', The New York Times, 13 December 2011. ^ An estimated construction cost of $US 4 billion is also given in Insight Guides, Myanmar (Burma), London, APA publications, 2014, p. 198. This guide book describes Naypyidaw (p. 198) as "a sprawling, soulless white-elephant city of empty 8-lane highways and giant concrete buildings". ^ For a brief description by a well-known international observer of the situation in late 2012, see Francis Fukuyama, 'What Myanmar Needs', The American Interest, 6 September 2012. ^ Thomas Manch and Kyaw Lin Htoon, 'The road rules costing Myanmar billions', Frontier Myanmar, 14 December 2017. ^ Construction on some sections of a six-lane highway are already underway (mid 2014) along the highway. Parts of the highway have already been widened to six lanes, and a number of bridges along the road are in the construction stage of being widened. For a discussion of safety concerns about the national highways to Naypyidaw, see the report about plans to improve the highway linking Naypyidaw and Mandalay at Kyaw Hsu Mon, 'Govt Calls for Foreign Investment in 'Death Highway' Upgrade', The Irrawaddy, 29 December 2014. The regions were called divisions prior to August 2010, and five of them are named after their capital city, the exceptions being Ayeyarwady Region and Tanintharyi Region. The regions can be described as ethnically predominantly Burman (Bamar), while the states, the zones and Wa Division are dominated by ethnic minorities. Yangon Region has the largest population and is the most densely populated. The smallest population is Kayah State. In terms of land area, Shan State is the largest and Yangon Region is the smallest. States and regions are divided into districts (ခရိုင်; kha yaing or khayaing, IPA: [kʰəjàɪɴ]). These districts consist of townships (မြို့နယ်; myo-ne, IPA: [mjo̰nɛ̀]) that include towns (မြို့; myo, IPA: [mjo̰]), wards (ရပ်ကွက်; yatkwet, IPA: [jaʔ kwɛʔ])) and village-tracts (ကျေးရွာအုပ်စု; kyayywa oksu, IPA: [tɕé jwà ʔoʊʔ sṵ]). Village-tracts are groups of adjacent villages (ကျေးရွာ; kyayywa, IPA: [tɕé jwà]). The Asian Boys' U19 Volleyball Championship, formerly known as the Asian Boys' U18 Volleyball Championship, is an international volleyball competition in Asia and Oceania contested by the under 19 men's national teams of the members of Asian Volleyball Confederation (AVC), the sport's continent governing body. Tournaments have been awarded every two years since 1997. The tournament doubled as the World Championship qualifiers, where the top 2 teams qualified for the FIVB Volleyball Boys' U19 World Championship. The current champion is Japan, which won its first title at the 2017 tournament. The 11 Asian Championship tournaments have been won by five different national teams. Iran have won seven times. The other Asian Championship winners are Chinese Taipei, South Korea, India and Japan, with one title each. The 2017 Asian Championship took place in Naypyidaw, Myanmar. The Asian Men's U23 Volleyball Championship is an international volleyball competition in Asia and Oceania contested by the under 23 men's national teams of the members of Asian Volleyball Confederation (AVC), the sport's continent governing body. Tournaments have been awarded every two years since 2015. The tournament doubled as the World Championship qualifiers, where the top 2 teams qualified for the FIVB Volleyball Men's U23 World Championship. The current champion is Iran, which won its second title at the 2017 tournament in home soil. Both tournaments have been won by Iran. The 2017 Asian Championship took place in Ardabil, Iran. The Central Bank of Myanmar (Burmese: မြန်မာနိုင်ငံတော်ဗဟိုဘဏ်; MLCTS: myan ma naing ngam taw ba ho bhan IPA: [mjəmà nàinŋàndɔ̀ bəhòʊbàn]; abbreviated CBM) is the central bank of Myanmar (formerly Burma). The 27th association football tournament at the 2013 Southeast Asian Games took place in Myanmar between 7–21 December. It was played among U-23 (under 23 years old) national teams, while the women's tournament had no age limit. The futsal tournament at the 2013 Southeast Asian Games took place between December 9–20. This edition of the tournament featured both men's and women's tournaments. All matches took place in Wunna Theikdi Futsal, Naypyidaw. Official drawing took place on 6 November 2013 in Naypyitaw, Myanmar. Maha Thetkya Yanthi Buddha (Burmese: မဟာသကျရံသီ ရုပ်ရှင်တော်မြတ်ကြီး); Pali: Mahāsakyaraṃsi) is a Buddhist temple in Ottarathiri Township, Naypyidaw Union Territory, Myanmar (Burma) that houses a 32 feet (9.8 m) marble image of the standing Buddha that weighs 700 tonnes (690 long tons; 770 short tons). The marble was sourced from a quarry 375 miles (604 km) north in Mandalay. The image was enshrined on 20 June 2015 in the Gandhakuṭi Pavilion (ဂန္ဓကုဋိကျောင်းဆောင်). Construction efforts were undertaken by ACE Construction Group, owned by Tint Hsan. Nay Pyi Taw Football Club (Burmese: နေပြည်တော် ဘောလုံးအသင်း) is a professional football club, based at Wunna Theikdi Stadium in Nay Pyi Taw, Myanmar. Owned by a prominent businessman, Dr. Phyo Ko Ko Tint San, the club was founded in 2010 and finished as runners-up in MNL Cup 2012. Nay Pyi Taw F.C. was founded in 2009 and played as an amateur club (ACE FC) in the Myanmar League, which was the highest football league in Myanmar. The first ever manager was Zaw Win, and the coach was San Lwin. Since 2010, ACE FC (now Nay Pyi Taw) Football Club changed as a professional football club to play in the Myanmar National League (Professional League) which was changed from Myanmar League. Nay Pyi Taw International Airport (IATA: NYT, ICAO: VYNT), (Burmese: နေပြည်တော် အပြည်ပြည်ဆိုင်ရာ လေဆိပ်; previously known as Ela Airport), is located 16 kilometers southeast of Nay Pyi Taw, the capital of Myanmar. Before the foundation of Nay Pyi Taw, this was referred to as the airport of the nearby town of Lewe. The airport officially opened on 19 December 2011. Naypyidaw Council (Burmese: နေပြည်တော်ကောင်စီ, also spelt Nay Pyi Taw Council) is the executive body under the President of Myanmar that administers Naypyidaw Union Territory.The Council is formed by the President, who appoints members based on constitutional requirements. The President must nominate both civilian and Armed Services personnel into the Council membership. The Council, which is headed by a Chairperson, reports directly to the President. The Constitution also holds that the Naypyidaw Council shares offices with the Ministry of Home Affairs' General Administration Department (GAD), and that the head of GAD serves as an ex-officio secretary of the Naypyidaw Council. Naypyidaw Union Territory (Burmese: နေပြည်တော် ပြည်တောင်စုနယ်မြေ; also spelled Nay Pyi Taw) is an administrative division in central Myanmar (Burma). It contains Naypyidaw, the capital city of Myanmar. Pyinmana (Burmese: ပျဉ်းမနားမြို့; MLCTS: pyanymana: mrui., IPA: [pjɪ̀ɴməná mjo̰]; population: 100,000 (2006 estimate)) is a logging town and sugarcane refinery center in the Naypyidaw Union Territory of Myanmar. The administrative capital of Myanmar was officially moved to a militarized greenfield site (which the leader, Than Shwe, dubbed Naypyidaw, or Royal City) two miles (3.2 km) west of Pyinmana on November 6, 2005. Pyinmana is approximately 200 miles (320 km) north of Yangon. The village of Yezin, a few miles north and east of Pyinmana, has been the site of national scientific research institutions since the late 1970s. During World War II, Pyinmana was the base of the Burma Independence Army (later renamed and reorganized into the Burma Defence Army by the Japanese). It was in Pyinmana that the army and its officers were trained. Later the Burma National Army changed sides, aiding the Allies with guerrilla warfare, and the operations were seen as a victory by the Burmese. Pyinmana became an icon in the Burmese Army where it was seen as the place where 'superior invaders' were defeated by the Burmese. This may be one of the reasons why the current junta chose to locate the newly built capital Naypyidaw in such close proximity to Pyinmana. Thatta Thattaha Maha Bawdi Pagoda (Burmese: သတ္တသတ္တာဟ မဟာဗောဓိစေတီတော်; Pali: Sattasattāhamahābodhi Cetiya) is a Buddhist temple on Udayaraṃsi hillock in Pobbathiri Township, Naypyidaw Union Territory, Myanmar (Burma). The pagoda is a replica of the Mahabodhi Temple in Bodh Gaya, Bihar, India. The replica is 162 feet (49 m) tall. The buddhābhiṣeka ritual of the pagoda's main Buddha image was held on 13 May 2014.The complex also houses replicas of key locations in Gautama Buddha's life (သံဝေဇနိယလေးဌာန), including his birth, his enlightenment, his preaching and his death, built for worshippers who have difficulties making a pilgrimage to Bodh Gaya. Uppātasanti Pagoda (ဥပ္ပါတသန္တိစေတီတော်, pronounced [ʔoʊʔpàta̰ θàɴdḭ zèdìdɔ̀]; officially called ဥပ္ပါတသန္တိစေတီတော်မြတ်ကြီး, also called the "Peace Pagoda") is a prominent landmark in Naypyidaw, the capital of Myanmar. The pagoda houses a Buddha tooth relic from China. It is nearly a same-sized replica of Shwedagon Pagoda in Yangon and stands 99 metres (325 ft) tall. Wunna Theikdi Stadium (Burmese: ဝဏ္ဏသိဒ္ဒိ အားကစားကွင်း) is a multi-use stadium in Naypyidaw, Myanmar. It can seat 30,000 spectators. The stadium hosted the 2013 Southeast Asian Games and 2014 ASEAN Para Games opening and closing ceremonies. The Yangon–Mandalay Expressway (Burmese: ရန်ကုန်–မန္တလေး အမြန်လမ်း) is an expressway in Myanmar (Burma) that connects the country's largest city Yangon and second largest city Mandalay. Opened in December 2010, the 587 km (365 mi) expressway has reduced the travel time between Yangon and Mandalay to 7 hours from 13 hours by train and from 16 hours by the old highway. The highway, which does not meet international design, construction and safety standards has seen a spate of accidents since its opening.